My favorite posts are the ones where I catalog the major appearances of (very) minor characters. These also get the fewest number of hits, but I can’t help myself. It’s my civic duty, after voting and recycling. If you want to check the previous ones I’ve done, please read about the appearances of Jack Flag, Mandrill, Ursa Major, and Carpenter. 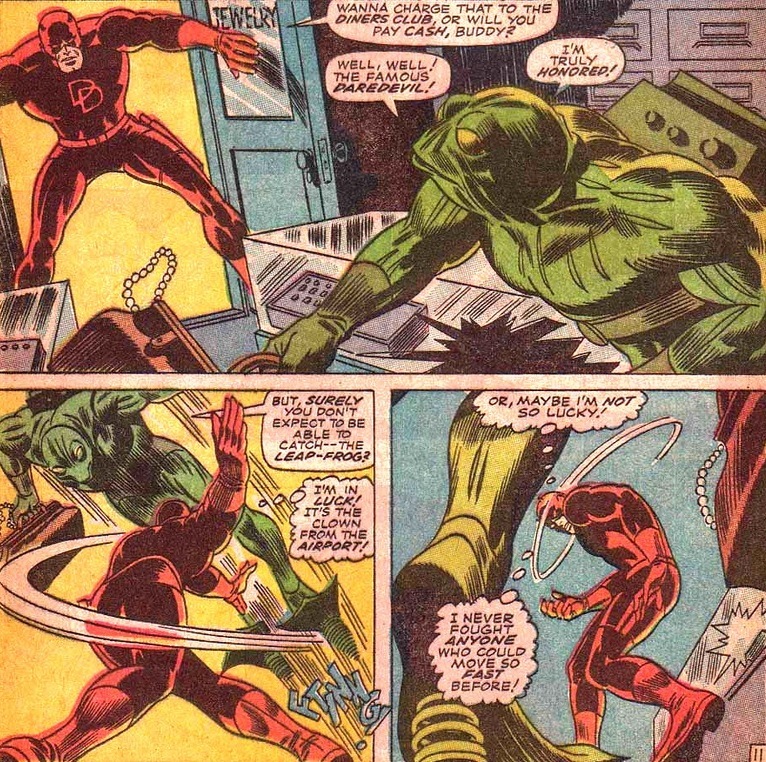 Yes, Daredevil’s never fought anyone who could move so fast before. Ever. 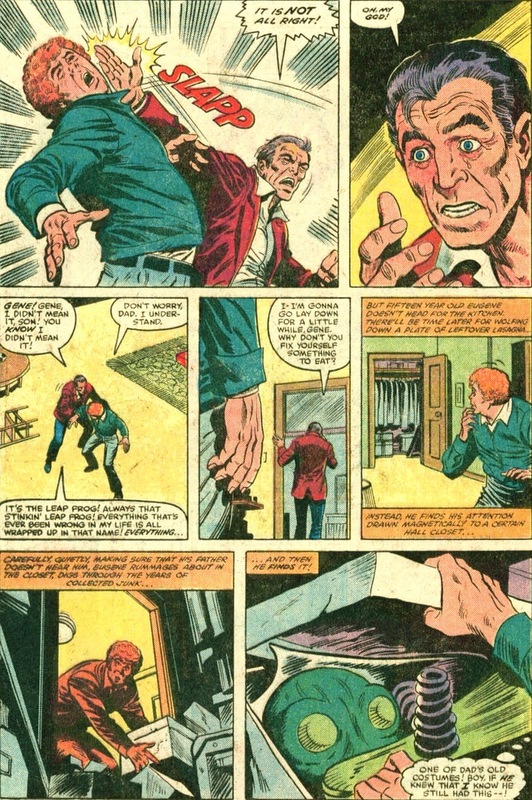 Let’s assume this is very early in Daredevil’s crime fighting career. 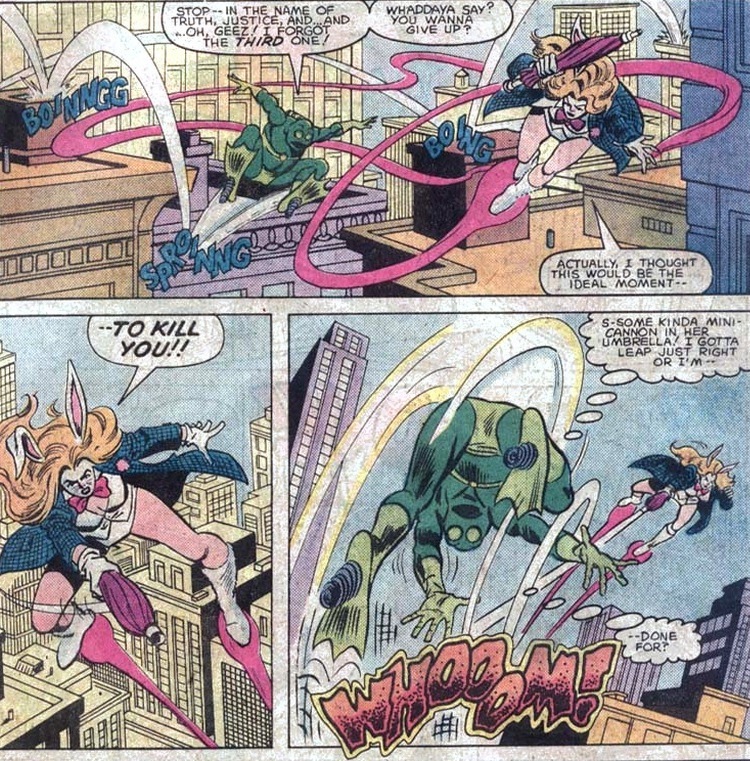 Writers, specifically DeMatteis, realized that selling this Leap-Frog as a serious supervillain probably won’t work in the long term. And this is in a universe where the world’s toughest men and women wear their underwear outside their pants. So, in a character-defining decision, Vincent retired from the role and his son Eugene was introduced. 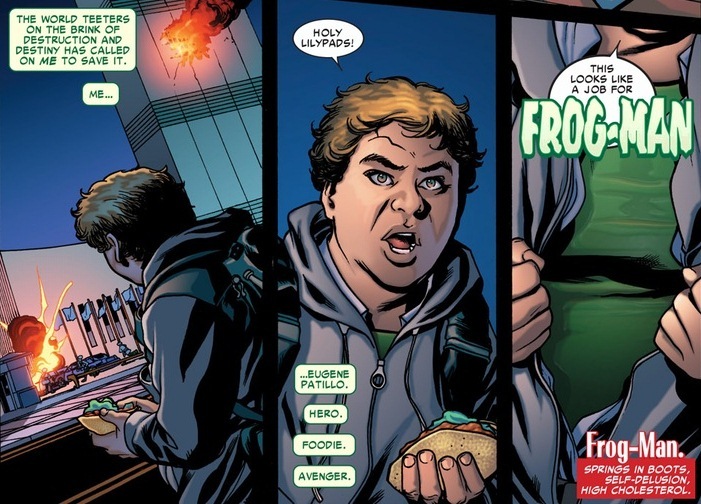 Teenage superheroes have and continue to be extremely successful. There’s totally an audience for child superheroes. 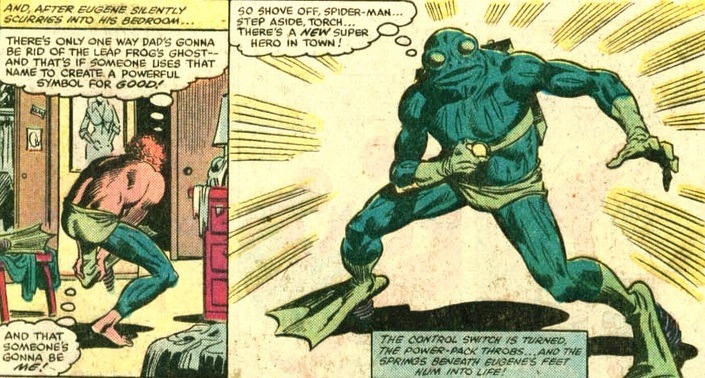 All I’m saying is that Peter Parker woke up the day after his origin story with a six-pack abs and perfect vision, instead of a chunky teen squeezing into a creepy scuba suit. 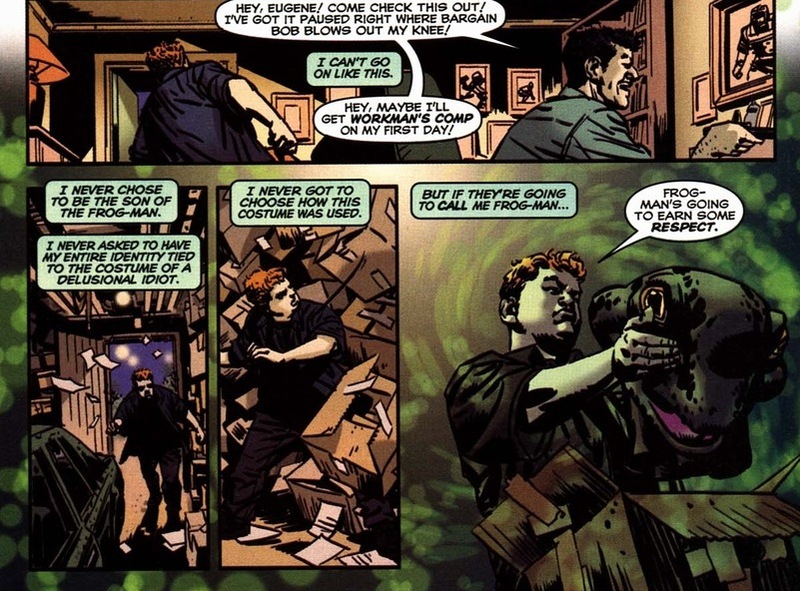 Immediately, Eugene served his purpose in the Marvel universe as comic fodder for the heroes he teamed up with, winning battles almost entirely through luck and accidents. The dude even received his own arch-nemesis: the White Rabbit. 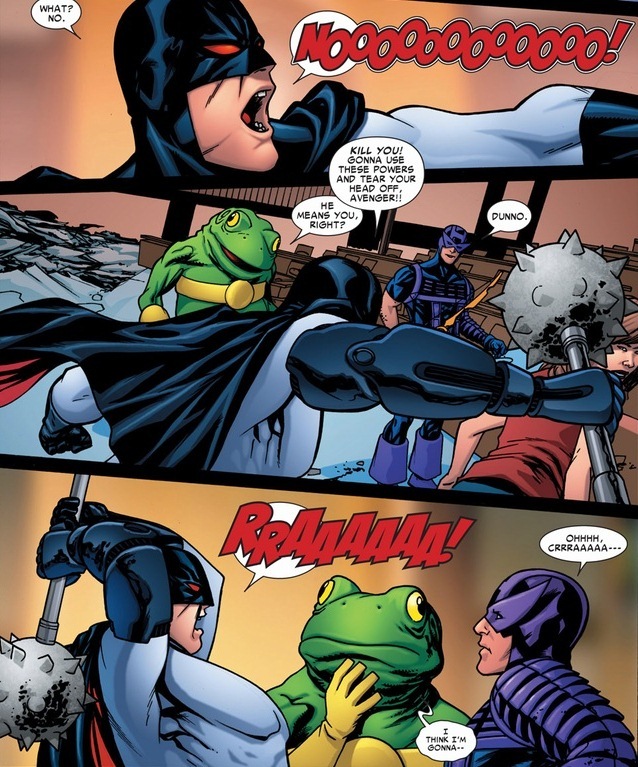 More importantly, Frog-Man fought crime solely to impress his father and restore that frog suit’s good name. Which as far as joke superheroes go, creates fairly heartwarming scenarios. 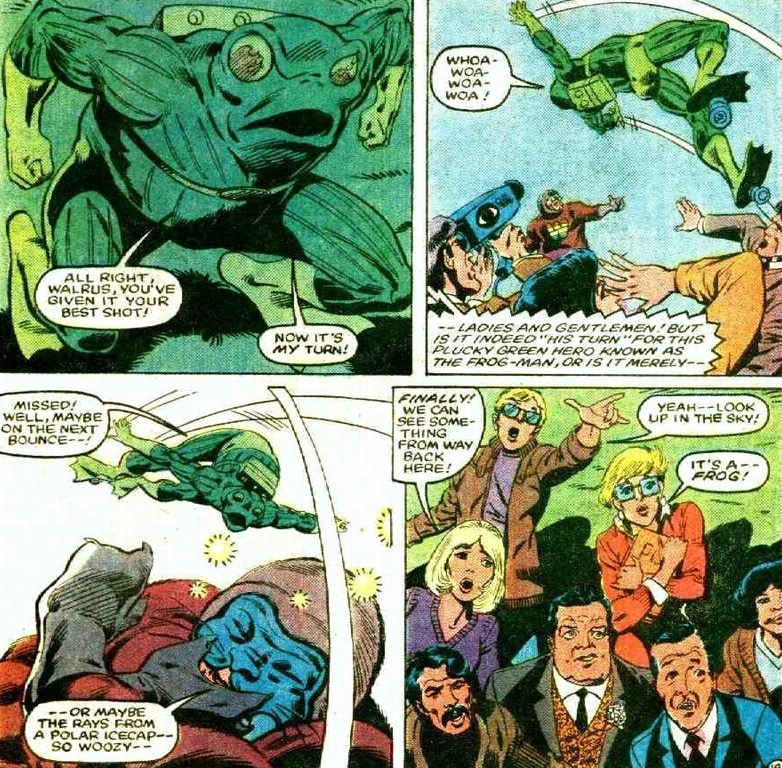 Over the years, Frog-Man would pop up in issues that needed a break from cosmic tragedy and depressingly emotional struggles. 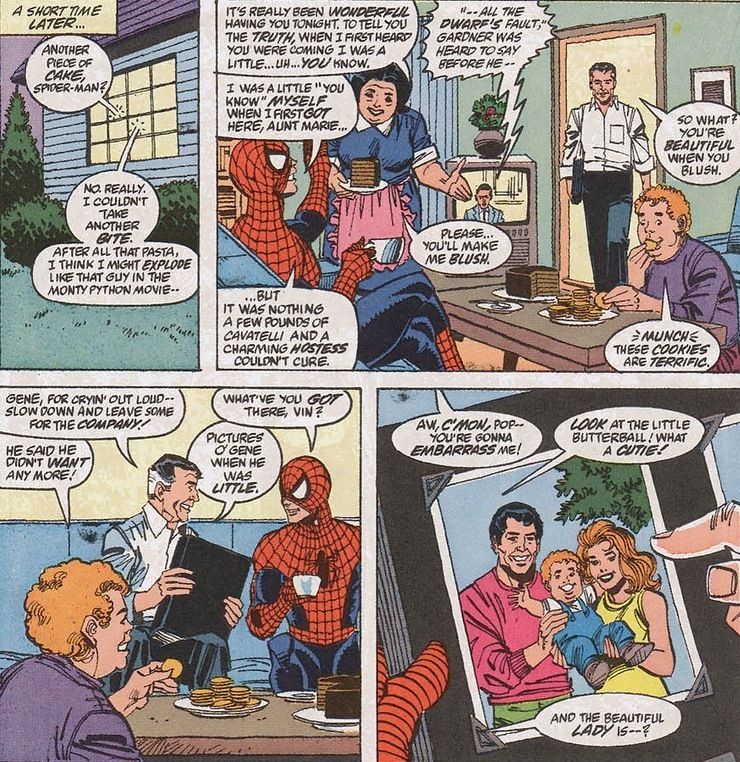 Spider-Man even went to Eugene’s house for dinner once. Like inviting a school buddy over to stay the night. 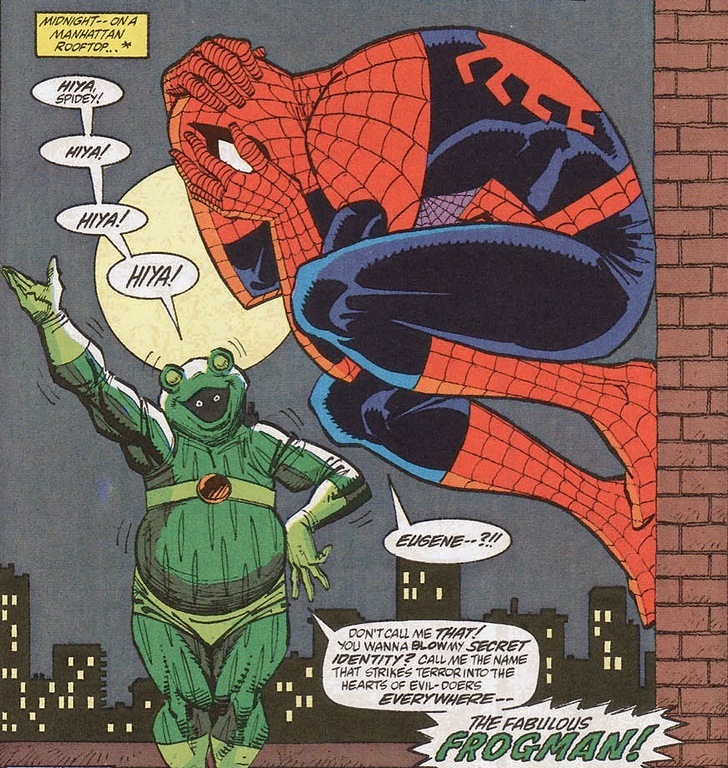 Look, this was before Spider-Man joined the Avengers and made all those new respectable friends. 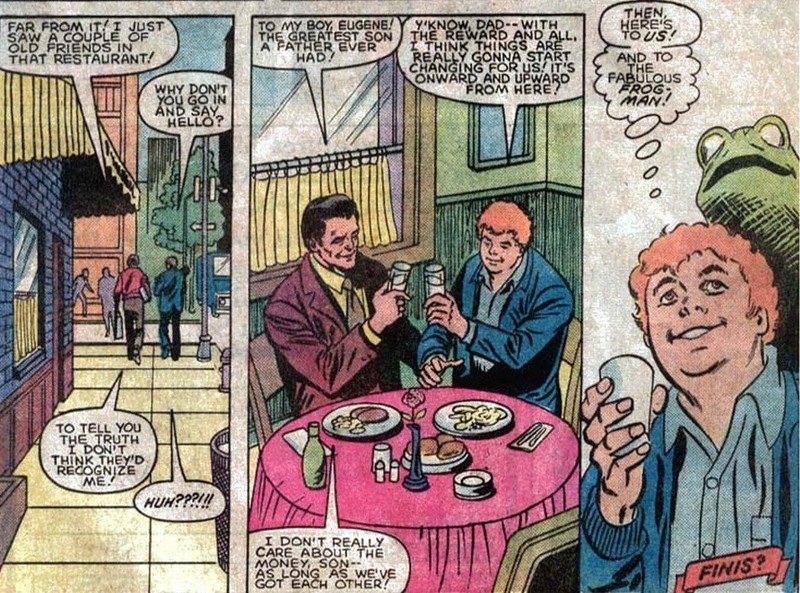 As you figure, dinner gets interrupted by crime, because superheroes aren’t allowed time off. 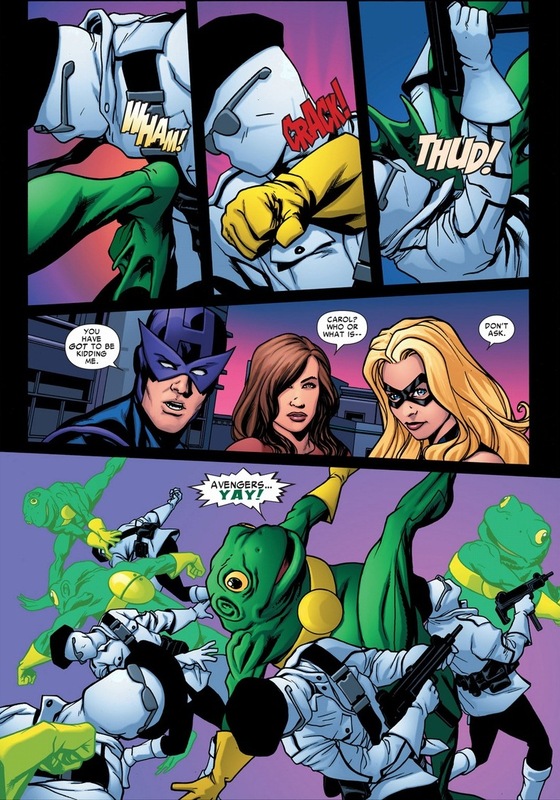 Jumping ahead ten years in comics, Frog-Man still operates in the city, albeit not much different than his previous purpose. After all, supervillains will always need bashing. To be fair to Eugene, he has some training now. Y’see, after the Civil War, Iron Man decided to place a superhero team in all fifty states. That’s a ton of superheroes needed. Plus, who do you send to battle supervillains in states that don’t have supervillains? Absolutely, Frog-Man. The ranks stretched thin in the mid-2000s. 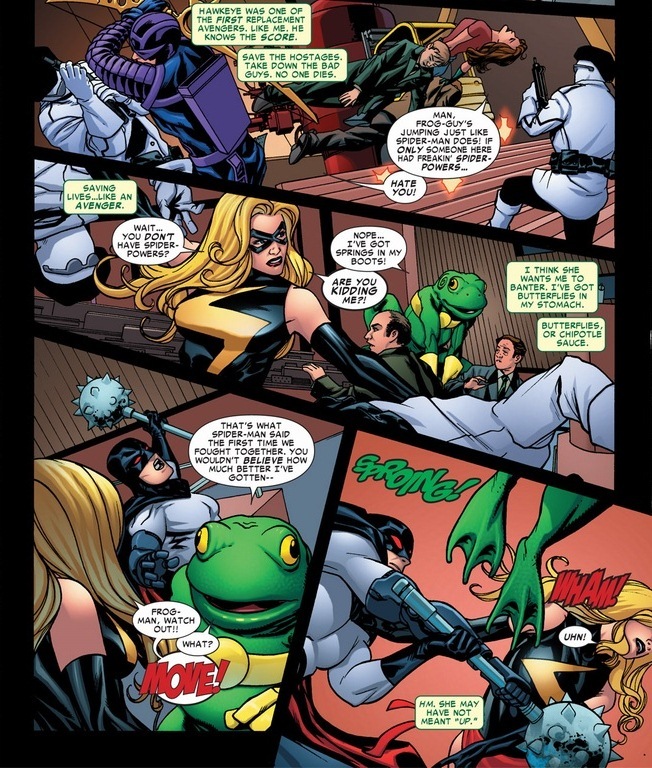 So yes, Frog-Man is an Avenger. Sort of. 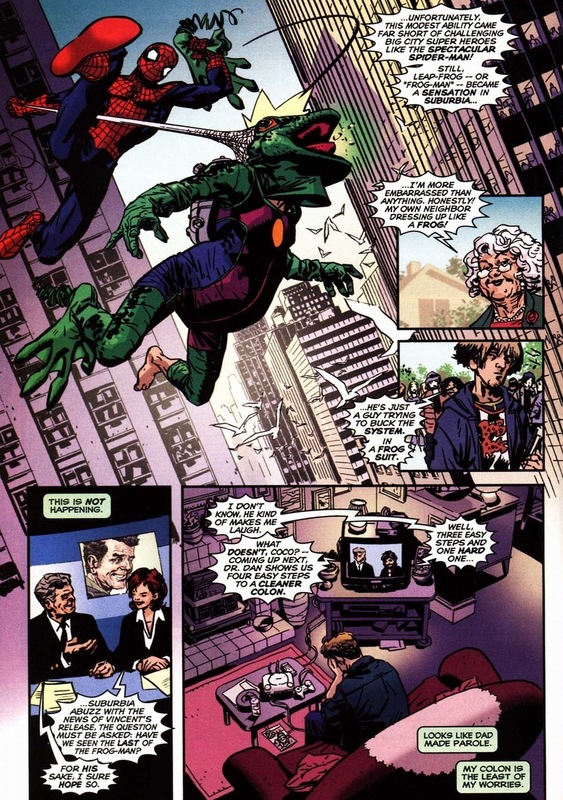 If you want to see for yourself, he appeared in select issues of Avengers: The Initiative. 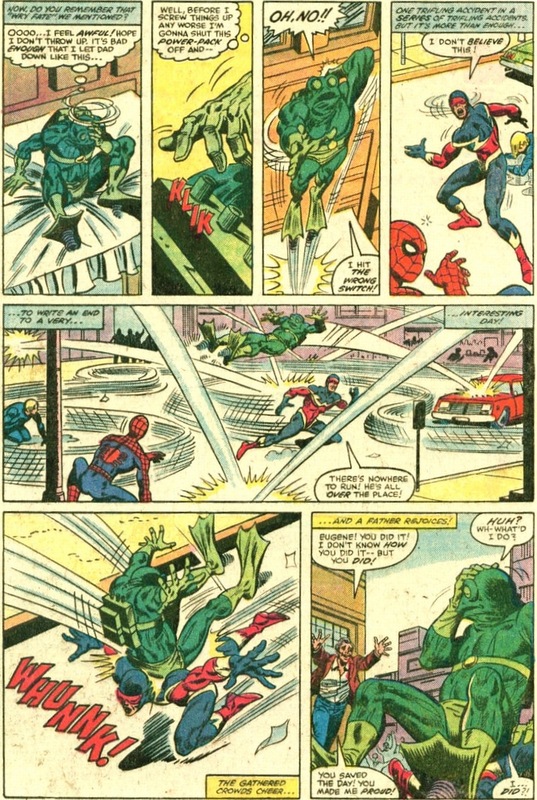 Though I believe that Frog-Man turned out to be a secret Skrull. The Marvel universe is complicated. 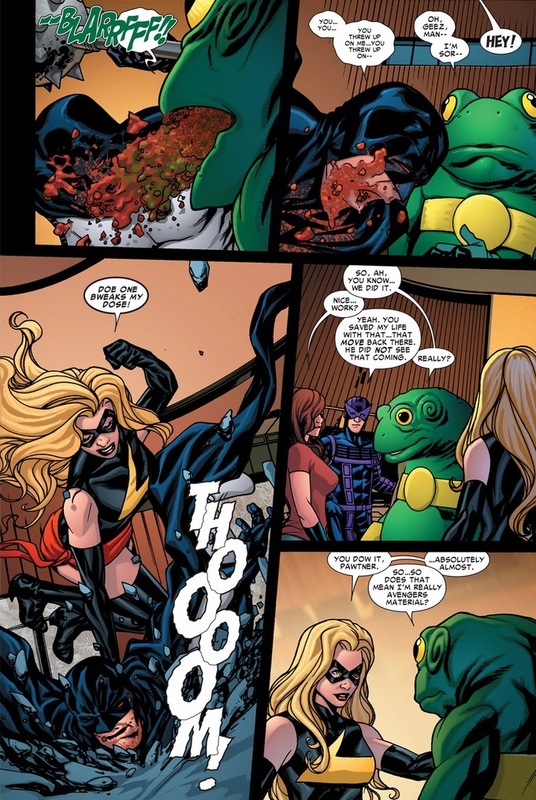 Frog-Man, Ms. Marvel, Hawkeye, and Jessica Jones head off to fight their very own supervillain: Flag-Smasher. The baddie’s a terrorist with a giant mace. That’s it. No superpowers, except those pesky spider-powers gifting the city at the moment. I’m sure Frog-Man will appear again one day. I don’t want tell the brilliant writers how to do their job, but I do hear there’s a new Young Avengers series coming soon. What’s one more hero on the roster? 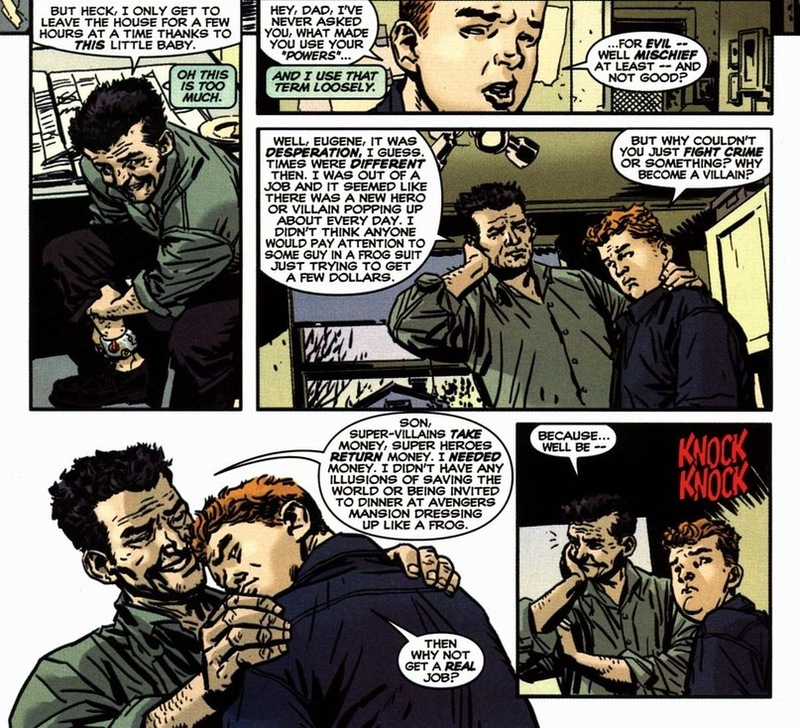 During his short and marvellous run on Daredevil, David Mack wrote an issue (or maybe an entire story arc) about Frog Man’s son: read it, it’s wonderful. That’s why I love conversations about comics: 9 times out of 10, I end up remembering a good comic book I almost forgot about, and then I search for it and read it again with so much pleasure. 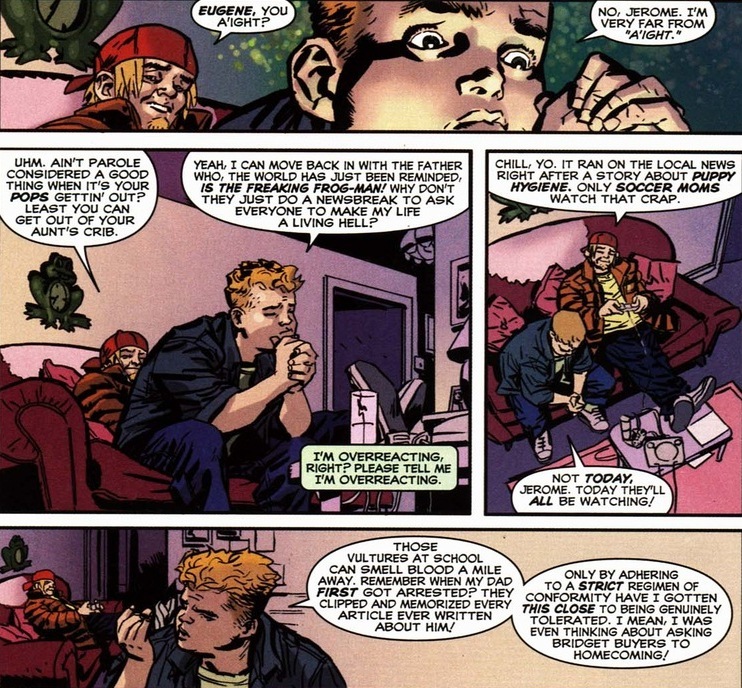 That’s what I’m going to do with that Daredevil issue: if I remember well, it should be right under my tv. 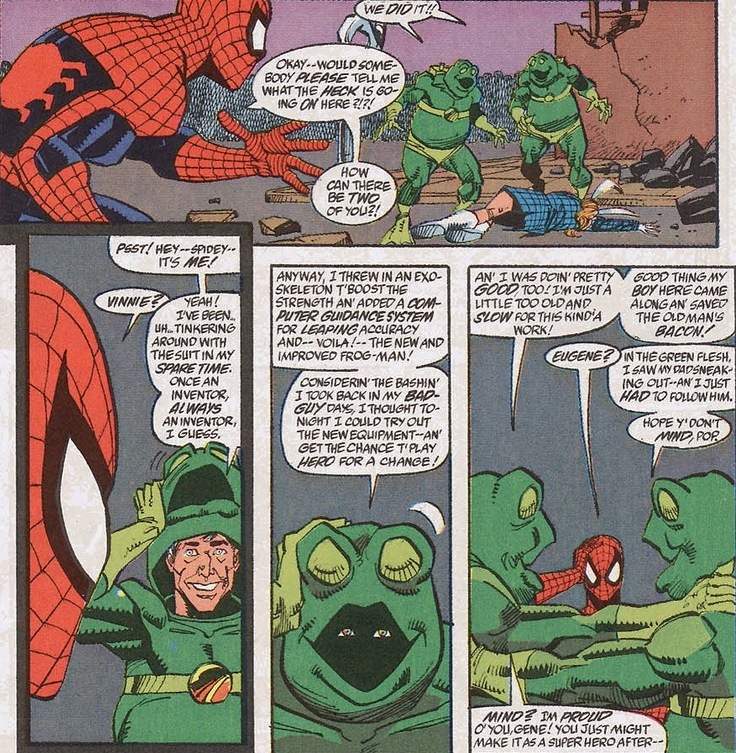 I re-read Spectacular Spider-Man #185 a few days ago. What a memorably bizarre issue. 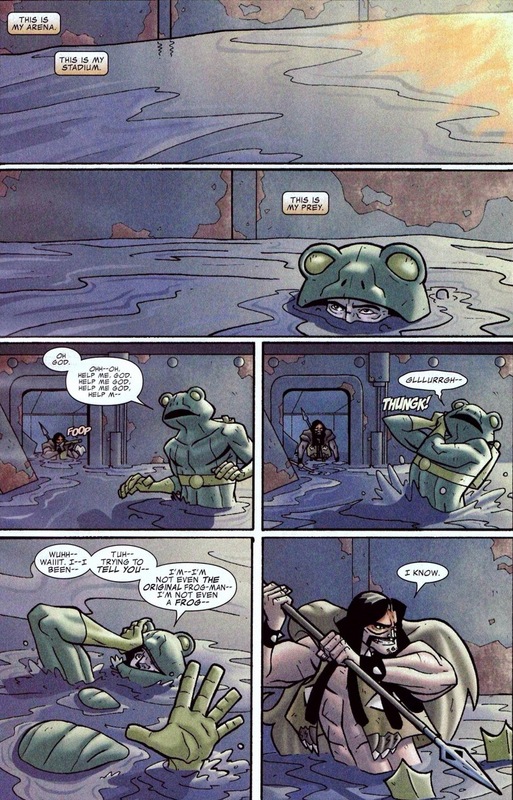 I guess I’ve always liked Frog-Man because deep in my heart I know that if I ever gained super-powers or a suit of armor or something, I’d probably end up being just as bumbing as Eugene Patillo. 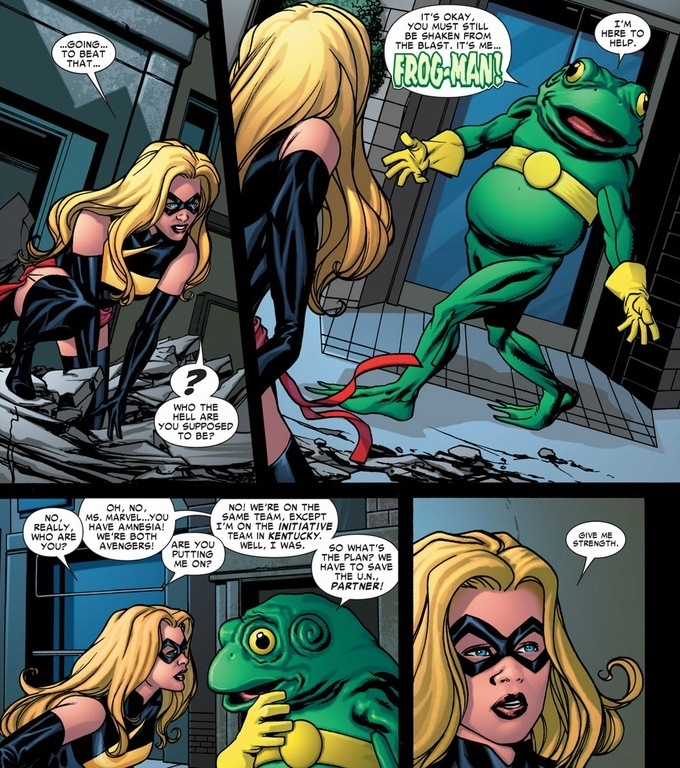 I was unaware of the Spider-Island: Avengers special, and the Frog-Man showed up in it. Thanks for the summary and the scans. 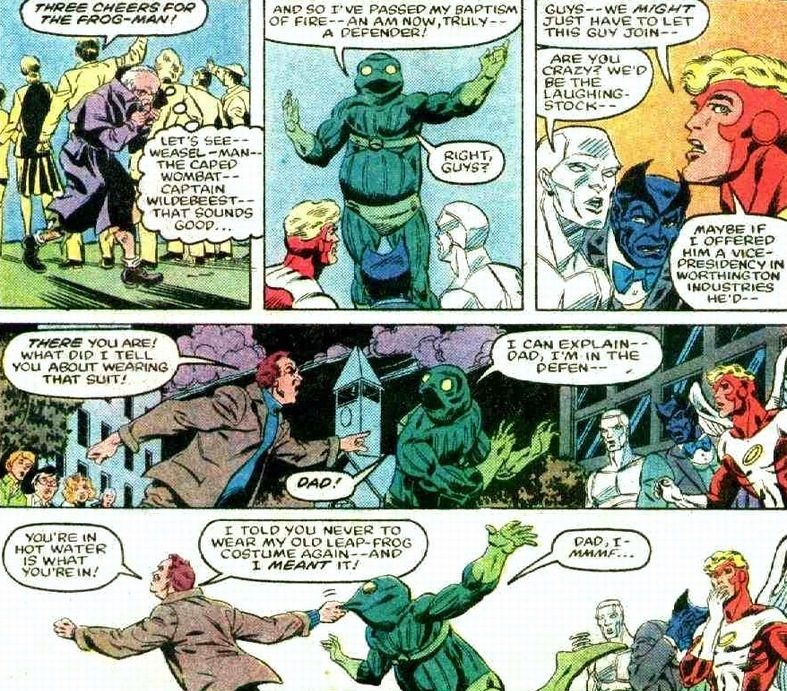 By the way, did you know there was a two part Marvel Fanfare story in the mid-1980s where Frog-Man teamed up with Captain America to fight the Yellow Claw? It probably ranks right up there with Doctor Doom being beaten by Squirrel Girl as one of the most embarassing supervillain defeats of all time.